Do you need to drill some holes and want to make sure you get the best drill press for the job? Drilling holes that are clean, the right size, and the same depth is very important whether you are a weekend warrior and woodworking is your hobby or you are a professional who has clients depending on you to provide the best work. Using a drill press to drill the holes you need is much easier than using a handheld drill and the results you get are far beyond what you would ever get from a cordless drill. Let’s take a look at 10 of the best drill presses money can buy. The Skil 3320 is just about the best benchtop drill press out there for woodworking enthusiasts who are looking to add a new toy to the workshop. You’ll be able to drill crisp, clean holes through wood, metal, and other materials thanks to the superior 5-speed system with a ½-inch keyed chuck that accepts larger drill bits to help you tackle those big projects on your list. The X2 laser system is a 2-beam laser that takes away all of the guesswork. You will be able to make sure you have everything lined up right so that when you go to drill your holes they are in the precise location you need them. Do you need to do some drilling at an angle? Angled drilling is no problem for the Skil 3320 drill press. With a tilting work surface that will lock anywhere between 0 and 45 degrees you will be able to drill all the angled holes you need. Are you going to be drilling some repetitive holes to make things like candle holders? You will love the adjustable depth stop feature that is perfect for repetitive drilling no matter what project you happen to be working on. The only complaint I really have about the Skil 3320 is the table can be a little bit hard to work with when you are using longer drill bits but in the rare instance you might have this problem you can always swing the table out of the way and make a temporary one so it’s not really that big of an issue. You get everything you need for all of the woodworking projects you have going on in your workshop all backed by a 3-year limited warranty and Skil 30-day money back guarantee. The Wen 4210 is the best table top drill press and will quickly become one of your favorite woodworking tools thanks to the powerful features that are packed into it. For starters, the 3.2 Amp 5-speed motor provides you with enough torque and power to easily tackle any project. With adjustable speeds between 600-3100 RPM you will not only be able to drill through wood but metal, plastic, and other materials will be a breeze too. The cast iron work space can easily be adjusted with the crank of a handle and tilts from left to right at a 45 degree angle to make angled drilling a walk in the park all while providing the sturdiness and durability you are looking for. The X-angle laser helps you to cut down on wasted material by ensuring that you are drilling holes exactly where you need them to be, and the locking linear depth stop allows you to take on any repetitive drilling task and conquer it with ease. Do you have bad eyes that make it hard to see what you are working on? You will have plenty of lighting thanks to the onboard work light that will brighten your workspace allowing you to easily see where you are drilling. Plus, the ½-inch keyed chuck that comes with the Wen 4210 drill press will allow you to use bits up to ½-inch in diameter, and you will never have to worry about losing it thanks to the built-in storage tray that keeps it safe when you’re not using it. The compact size makes it perfect for any small workspace and with a 1-year limited warranty you simply can’t go wrong with the Wen 4210 and you can easily see why it is one of the best drill presses on the market. There’s no denying the quality of Craftsman and the 10-inch﻿ bench drill press provides all of the quality that you have come to expect from a leading tool manufacturer. With the 5-speed motor that operates at speeds between 620-3200 RPM you will be able to drill through all of the wood and other materials you are working with like a shark swimming through water. The 6 AMP motor gives you all of the power and durability you need while the adjusting rack and pinion table allows you to easily set the height for superior accuracy. Want to use larger drill bits and sanding drums? The ½-inch keyed chuck accepts drill bits and sanding drums with a ½-inch shank allowing you to drill holes up to 2 ½-inches deep with ease. You get a laser guide that ensures you are drilling holes exactly where you want them, and the scaled steel fence helps you to align your wood pieces and keep them braced while you are drilling. Need more light for your workspace? You will be happy to find the snake light protruding out of the side of the Craftsman bench drill press that will illuminate your wood and make it easy to double check yourself for accuracy. The last thing you want is to be drilling holes in the wrong places on the show-side of your project. 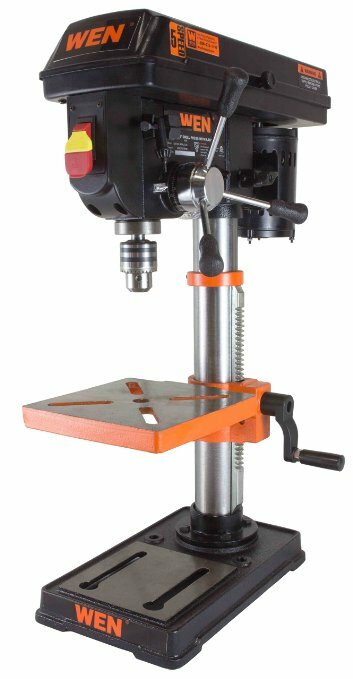 The depth stop on this bench drill press is great for any repetitive drilling project you have going on and the high quality construction ensures that you get repeated use out of it for a very long time. 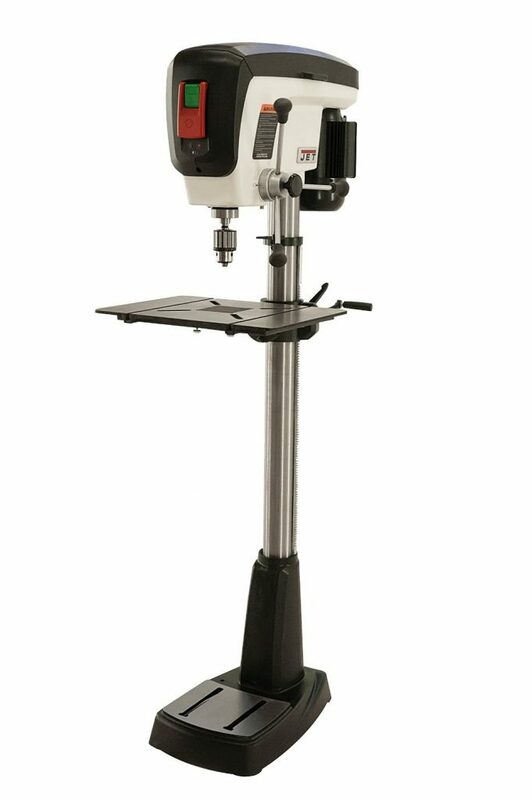 Sure…this is not a super high quality drill press that you will find on the table top of a high end machine shop, but if you are a hobbyist or casual user, then you will find everything you are looking for and more in the best benchtop drill press Craftsman has to offer. Let’s start with the ¾ horsepower motor that is powerful enough to take on any woodworking project you put in front of it, and with 16 speeds you will be able to drill holes through almost any type of material you are working with. 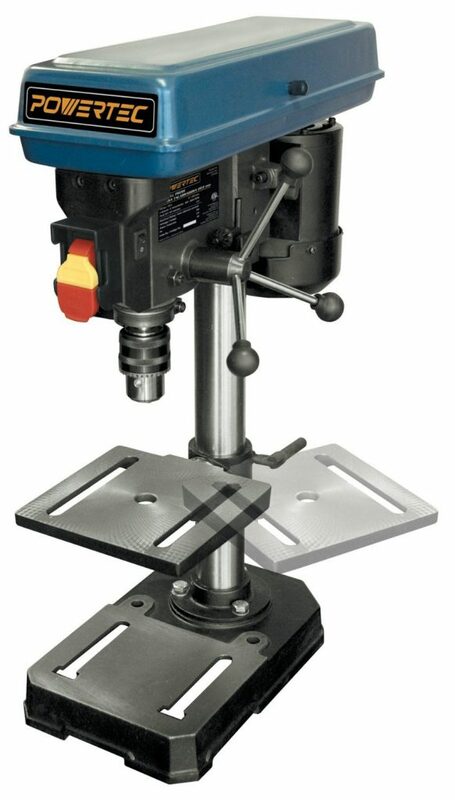 You will really love the oversized worker’s table the Delta floor drill press boasts. Not only is it large enough to hold bigger pieces of wood steady while providing a sturdy work surface but it makes angled drilling an easy task by tilting left and right at a 90-degree angle and to the front at a 48-degree angle. The oversized table also features T-slots for clamping and you will be able to remove the centerpiece for those pieces where you want to drill down all the way through the table. How does that sound so far? Let’s take a look at the auto-tensioning belt drive system that makes switching from low to high speeds fast and easy so that there’s no delay in getting your work done. In fact, you can easily switch from 150 RPM to 3000 RPM in around a minute flat…talk about fast! It has a 6-inch stroke so if you need to be able to drill deep holes, the Delta 18-900L has you covered. You will be able to set up repetitive drilling in seconds thanks to the micro-adjustable depth stops and the independent depth scale which you can very quickly zero out and start your project or move to the next phase seamlessly. 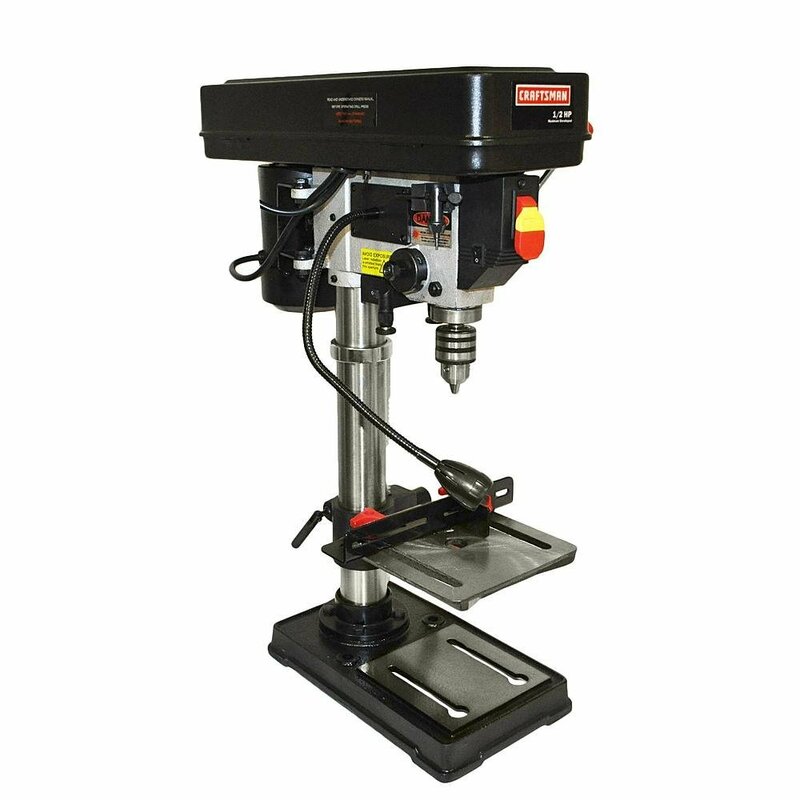 The non-tip cast iron base provides you with all the stability you need to ensure your drill press stays protected in case it is accidentally bumped, and the bright LED light provides you with maximum visibility. It’s easy to see how the Delta 18-900L made it onto our list of floor drill press reviews and with the assurance of a 5-year warranty owning one is a no-brainer. 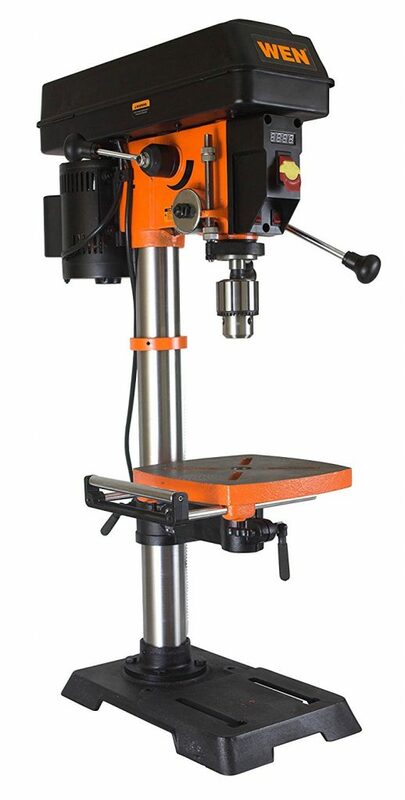 The Wen 4214 is an excellent mid-sized benchtop drill press that is loaded with features that you would usually only find in higher-grade professional use drill presses. Its 5 Amp, 2/3 horsepower motor gives this drill press plenty of torque and drilling power while the variable speed allows you to make adjustments anywhere between 580-3200 RPM displaying the exact speed on an easy to read LED screen. Changing speeds is as easy as turning the adjustable lever so there’s no messing around with pulleys and belts. You have plenty of work space with the square 9 ½-inch cast iron work table and if you need more you can use the table roller extension to get up to 17-inches of additional support for the wood you are drilling. The table also tilts at a 45-degree angle from left to right making angled drilling very doable and with the built-in laser light, you will always hit the spot you are aiming for allowing you to drill precise holes the first time. You can easily use drill bits up to 5/8-inch in diameter thanks to the MT2 spindle taper, and with a 3 1/8-inch stroke you will be able to drill deeper than most other benchtop drill presses allow you to. Wen is giving you a truckload of features that you would normally pay a small fortune for from other manufactures, and they stand behind their quality as one of the best table top drill press with a 2-year warranty. If you are looking for the best drill press for the money but you still want to get as much professional quality as possible, then you will find the perfect combination in the Shop Fox W1668. This thing has a powerful ¾ horsepower motor that allows for spindle speeds between 250-3050 RPM so you will have no trouble with any woodworking project or any other type of material you might need to drill through. The 5/8-inch chuck allows you to use drill bits up to 5/8-inch in diameter, and with a tilting 90-degree angle table you will be able to drill holes wherever you need them whenever you need them. One of the coolest things about the S﻿﻿hop Fox benchtop drill press is that it doubles as an oscillating sander so it’s like you’re getting 2 tools in 1! There is even a dust collection port attached to the side so you can let the cleanup take care of itself, and you can do it all in a matter of seconds by making a few quick tool-free adjustments. You even get a 3-piece spindle sander drum kit that comes with everything you need and that includes the sandpaper to fit the 1-inch, 1 ½-inch, and 2-inch drums. The Shop Fox W1668 benchtop drill press is a lot of tool for the money! 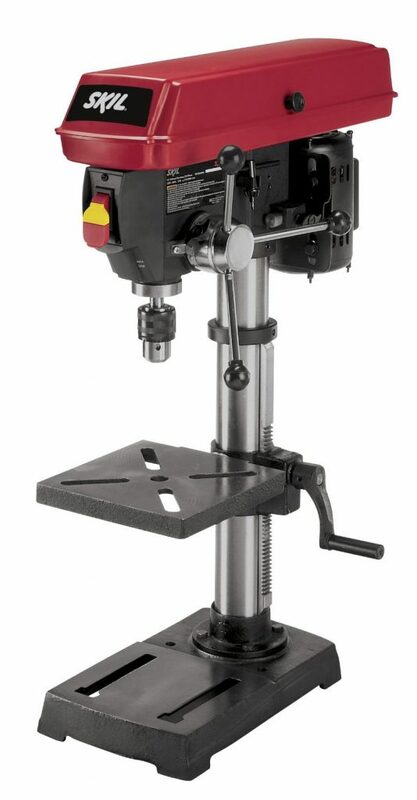 The Jet JDP-17 has some of the best floor drill press reviews out of all the drill presses I have looked at. It’s no wonder people love this thing. There are some very nice features packed into it. For starter, the ¾ horsepower motor makes any project easy, and the v-drive belt system features one-handed belt tensioning which makes rapid speed changes easier than ever. Need to drill some deep holes? You can lower the spindle a full 5-inches with one simple turn of the handle, and the built-to-last onboard LED light makes it easy to see everything you are doing. Is safety a big concern for you? You’ll feel safe and secure knowing the power switch has a safety key and a big, paddle-style off switch that can easily be flipped whenever you need to shut the drill press off. The spacious 14” X 19” table is large enough to accommodate any project you put on it, and the built-in depth stop allows you to do as much repetitive drilling as your heart desires. The Jet JDP-17 was built for performance and with all of the great features that are built-into it you can see that it will easily stand up against even the toughest projects. You can also rest-assured knowing that Jet stands behind the JDP-17 with a 5-year warranty that will cover you in case something happens to go wrong. 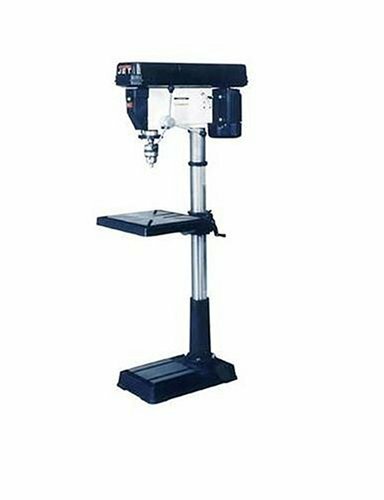 If you are looking for the best floor drill press for the money then you can’t go wrong with the Jet JDP-17-inch 3/4-horsepower drill press. If you are someone who likes to get the most for the money then you are going to love what the Powermatic PM2800B Drill Press has to offer. Let me guess…you’re someone who doesn’t like all of the belt changes you have to make to change speeds, right? Nobody does…and you will never have to worry about making any - thanks to the mechanical variable speed adjustment that gives you a full range of speed that displays on a digital RPM readout allowing you to perfectly optimize the speed. The table will turn at a 90-degree angle to the left or right so you will be able to drill deep holes in vertical posts or any other tall piece of wood and the quill lowers 6-inches with just a single turn of the handle. The stand is strong and sturdy so you will never have to worry about the drill press tipping over and being damaged if an accident happens. You get all of the design, innovation, and durability you are looking for in the Powermatic PM2800B floor drill press all backed by a 5-year warranty. If power is what you are looking for then the 1.5 horsepower on the Jet JDP-20MF should get your motor running. 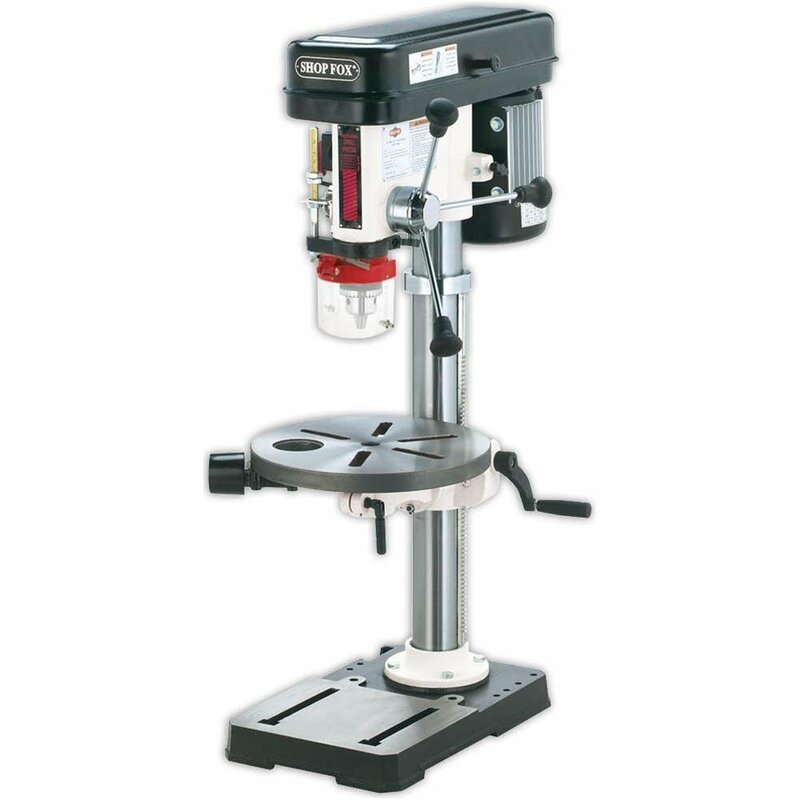 This drill press is a 12-speed beast that allows you to go from 150 RPM all the way up to 4200 RPM seamlessly with a simple one-handed operation that allows you to change bits to adjust the speed. It also includes a ¾-inch drill chuck and key that allows you to use any drill bits up to 3/4 –inches in diameter and you will be able to see exactly what you are doing thanks to the built-in bright LED light. The large 18 ½-inch X 16-inch table size makes even the largest of projects easy to handle by giving you plenty of space to secure the wood you are drilling. This floor drill press can be powered by either a 115 or 230-volt plug so no matter what you want to plug into…you’re covered. This is the best woodworking drill press for the money because its power-packed features are suitable for both the home and professional woodworker. You get the quality that only Jet provides and you get the peace of mind knowing that you are covered by a 2-year mechanical and 1-year electrical warranty that will cover you under any circumstances. Do you have some small woodworking projects or craft projects to do? The Powertec DP801 is the perfect size for tackling those smaller sized projects where more delicate, intricate pieces are involved but it still has some powerful features that make it the best benchtop drill press on the market for small jobs. The 2/5 horsepower 5-speed motor adjusts to 620, 1100, 1720, 2340, and 3100 RPM and it has built-in safety features that prevent the power switch from accidentally turning on. The cast iron, square 6 ¼-inch table will swivel 360 degrees to give you all of the accuracy…precision…and space you need. The chuck will fit drill bits up to ½-inch diameter and it has an 8-inch swing with a spindle that travels 2-inches and enough power to drive the bit down into the wood, the DP801 is the perfect option for a cheap drill press. The Powertec DP801 Baby Drill Press might be small in size but it packs a powerful punch and has a 1-year limited warranty and 30-day money back guarantee to back it up. 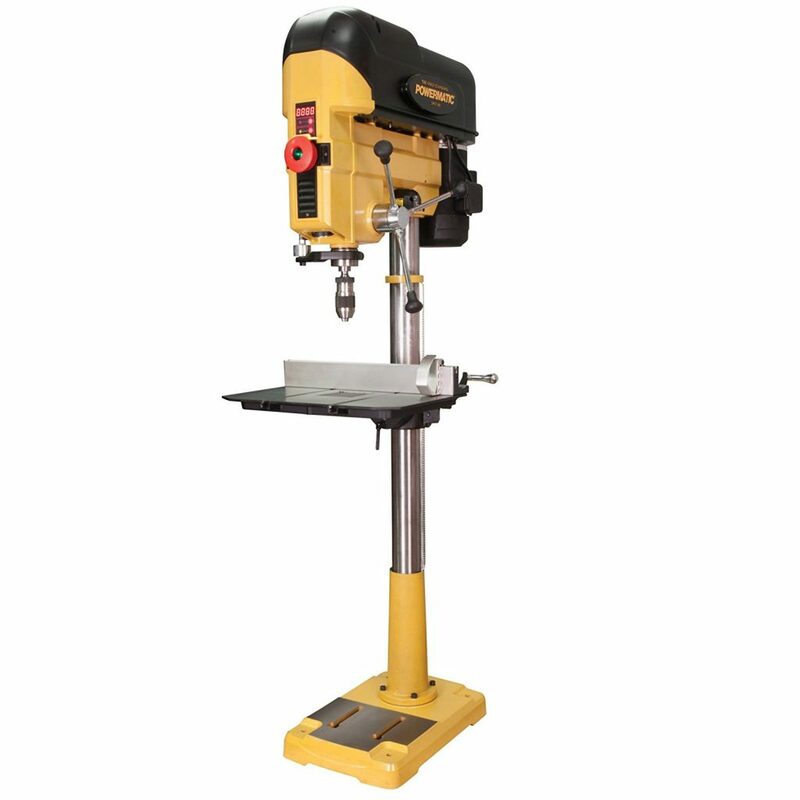 Whether you are looking for a baby, benchtop, or floor drill press you will easily find the best drill press in one of the top 10 we just covered. 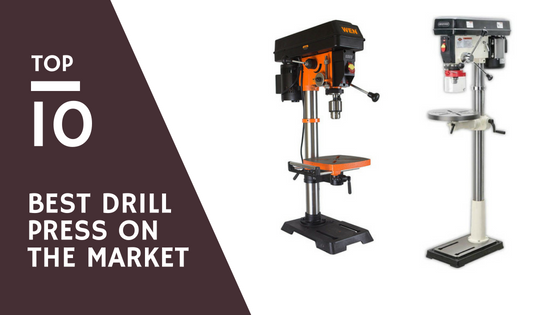 Not only will you get the best drill press for the money but you now know which drill presses offer the highest quality for the money and which ones have all of the features you need to tackle whatever projects you have in mind. No matter if you are someone who does woodworking as a hobby or you are a professional woodworker, there are table top drill presses and floor drill presses that offer something for everyone. If you are looking for the best benchtop drill press I would go with the Shop Fox W1668 because you are not only getting a high quality drill press but you are getting the power of an oscillating sander as well. My recommendation for the best floor drill press is the Powermatic PM2800B because the variable speed and no belt change along with having a digital RPM readout allows you to adjust speeds quickly and easily so you can stay focused on doing the best job you can with your woodworking project. I hope these drill press reviews have really helped you to find the best drill press for woodworking so that you can have all of the quality you need for the price you want to pay. Woodworkers are regularly challenged each time they have a project to work on. They want each project to be precise and having a band saw added to their arsenal of creative tools is considered to be a game changer. In this band saw reviews, you'll learn how this piece of equipment allows woodworker make use of the wood to its complete potential. Band saw is considered by some as one of the most vital part of their workshop as it totally enhances their creativity and accuracy at work. You, as a potential or even professional woodworker, can certainly find great value in this tool and it can well become one of your favorite equipment. ​For those starting on building up their own woodworking shed, a band saw can be seen as a tool to be acquired at a later date. Some do not consider it their priority when, in fact, it should be one of the tools needed when stacking up your shed due to its functionality. It is a versatile machine and your capability as a woodworker is greatly enhanced with this piece of equipment that no other can probably equal. 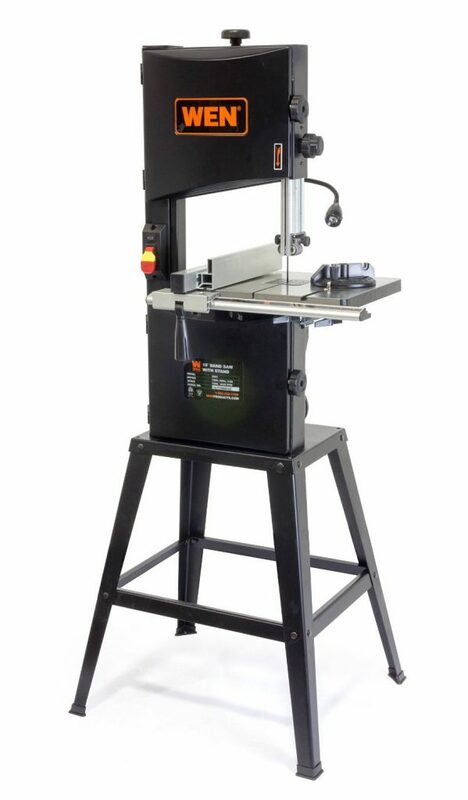 ​Purchasing your own band saw is not that difficult. 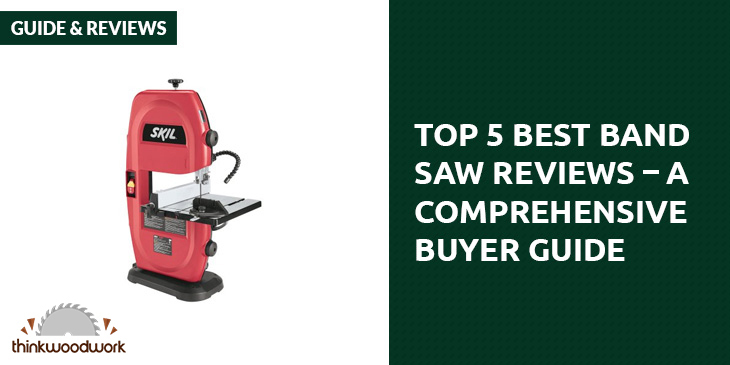 There are band saw reviews to assist you in choosing the ideal tool for your needs. Remember when it comes to choosing this tool though that you always consider the capability of the machine and go for quality as far as your finances will allow you. You have the opportunity to save on other equipment so make sure you get the best quality that your money can buy. You will never go wrong choosing this fine piece of equipment when working on your home project. 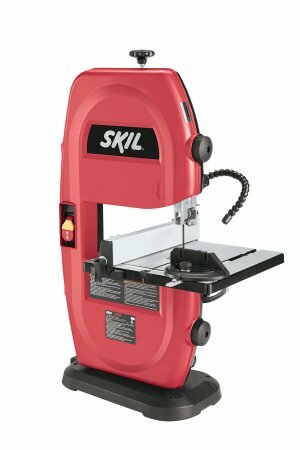 The SKIL 3386-01 nine inch band saw is such a flexible tool that offers a 2.5 amp motor with a ribbed aluminum top. Not only that, the table has a tilting adjustment that ranges from 0 to 45. It only features a blade guide adjustment which is great for custom depth options. This amazing woodworker’s tool is smartly designed with a flexible lamp that has been conveniently attached for better visibility. A miter gauge is also thoughtfully attached. The table top itself has a full dimension of 11-13/16- inch square and it gives you a cutting depth of 3-1/8 – inch providing a throat depth of 9 inches at the same time. The addition of the blade, parallel guide, miter gauge hex key and the flexible work light just completes its overall functionality that makes it ideal for your discriminating taste. This intelligently designed equipment weights about 35.1 pounds and dimension of 31.1 x 16.2 x 12.8 inches. Beginner woodworkers and even experts will appreciate this tool in their shed seeing how it is multi functional and efficiently cuts irregularly shaped wood and great for ripping lumber down to thinner pieces. This is efficient in cutting through different kinds of wood material using the 6 – TPI blade. Doing quick angle and height changes is not a problem using this tool. The rack and pinion adjustable blade does this fine job in a stride. It provides plenty of power for your needs and the hobbyist in you will be glad to have this equipment handy. The WEN 10-Inch Two Speed Band Saw is a fine example of what a power tool should be all about. When you are looking for a functional and powerful addition to your workshop, then this is the ideal tool to have. This great equipment has a 3.5 amp motor with a 9-3/4 inch throat and is handy when working since it cuts up to 6 inches deep and 9-3/4 in width. It comes in a two speed operation which means you can work on speeds of 1520 or use 2620 FPM. The blade use for this saw measures 72 inches and size is from 1/8 to 1/ inch that can make a selection of cuts from the complex cuts to powerful ones. It has large work table that allows you more than enough space to do your work properly. The table dimension is at 14 x ½ inches and allows up to 45 degrees swivel. You can make consistently great cuts as the flexible work light is attached to light your way. The 3 in 1 dust port is a wonderful addition as it fits different sizes of dust extractor hoses. The fence allows for straight cuts and there is the miter gauge to help out with the angled cuts. You can expect to work with this powerful tool for quite a long time as this trusty equipment’s ball bearings provides a smooth operation each time. There is no need to worry about setting it up due to its easy to assemble stand raise and does not take too much space on the work bench. 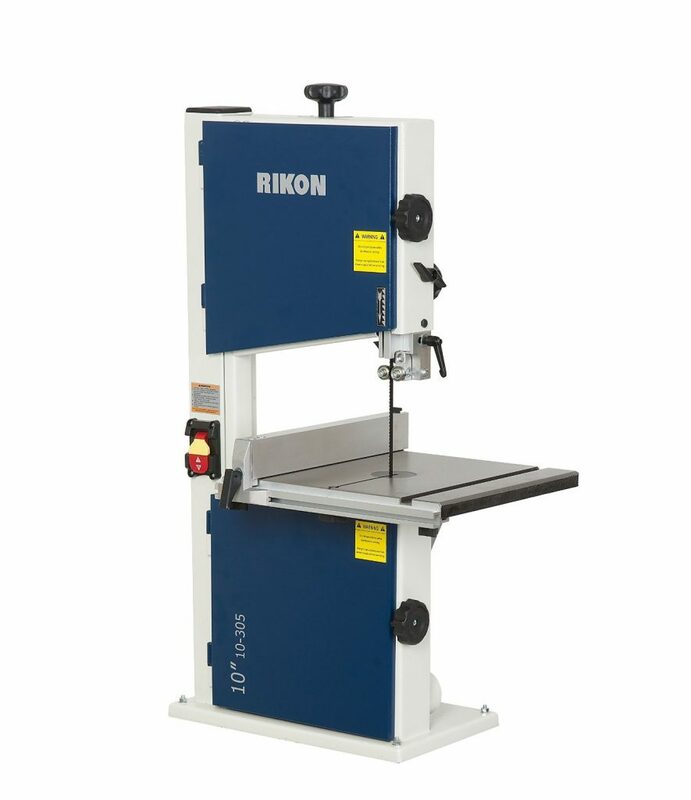 Value for your money is what you can depend on when you go with the Rikon 10-305 Bandsaw. Professional and hobbyist alike will greatly appreciate what this band saw can do for them. This bench top design can provide all functionality of a full size band saw with no hesitation. This has a large cast iron table providing you with a sturdy base for your work. There are other wonderful features that can’t be denied such as edge facing thrust bearings, a truly powerful 1/3 Hp induction motor with a 4-5/8 cutting capability that makes this machine ideal for the woodworker enthusiast. This is easy to assemble and comes with all the full quality features that all other larger band saw offers. It also comes with a fence and a truly great micro adjustable guide post height. You’ll be surprised at how your work area is free from dust due to its 2 ½ inch dust port. This is a sturdy, dependable machine to add to your tool shed perfect for when you don’t want a bulky addition but can still provide great quality. 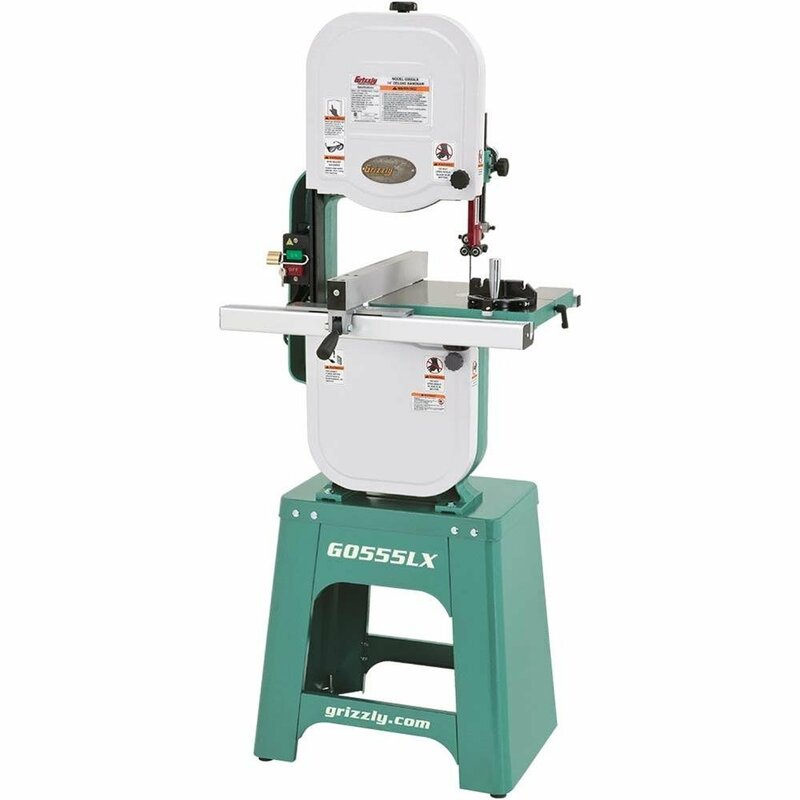 The Grizzly G0555LX Deluxe Bandsaw offers woodworker quality and power that allows you to do your work in no time. True and accurate cuts are what you can expect with this handy addition to your shop. This tool has been purposely done to redefine what should a 14 inch bandsaw is supposed to be like. Great features have been integrated into this tool which you would not have normally see in other band saw out in the market or would have been an optional aspect of this power tool. This tool has cast iron frame with deluxe and sturdy stand plus power coated paint. The computer balanced cast iron wheels just provides another reason for expert woodworkers and hobbyist to add this to their tool shed. The wheels are perfectly aligned and have rubber tires. The fence is durable made with extruded aluminum T-shape re-saw fence. It also has a miter gauge and fence scale and flexible for blade lead. It has a 1 HP motor with a table that measures 14” x 4” x 1-1/2 that tilts at 45 degrees to the right and 10 degrees to the left. This is indeed a great addition to your work shed and you are sure to get your money’s worth. Impressive does not begin to describe this piece of power tool. 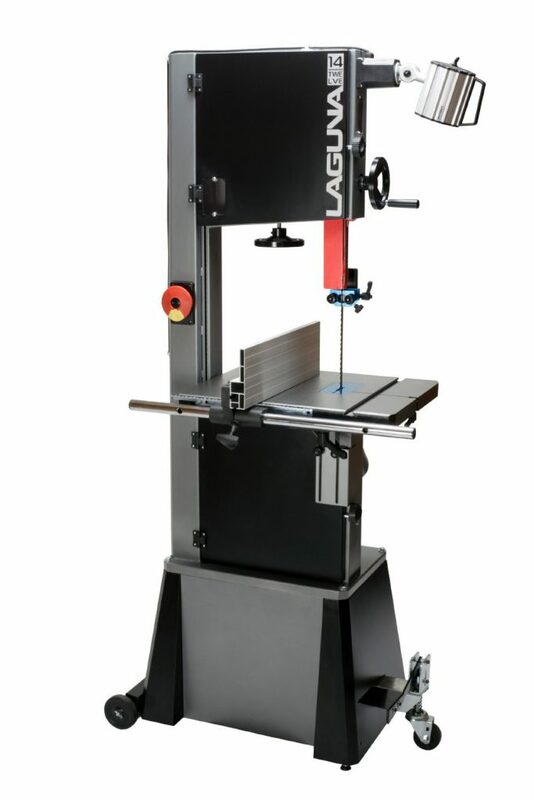 Serious woodworkers will appreciate how the Laguna Tools MbAND1412-175﻿ Bandsaw delivers excellence and great service. It is not just all muscle but comes with finesse as well. it never wavers as it cuts through solid oak yet operates quietly enough that you barely need ear protection. It comes with a pyramid spine and 1 ¾ HP TEFC Motor. You’ll be pleased with its quick release tension and the 15 volt outlet. This quality machine has a micro polished table that measures at 21 x 6 inches that is mounted into an overly large Trunion coupled with aluminum fence. This features solid cast wheels as well. The wheels are computer balanced and are fitted with polyurethane one piece tire. This added feature makes it ultra durable as compare to other machine and it is made to run cooler. It comes with Laguna’s trademark of really smooth worm gear and pinion which lessens flex while extended fully. With the above gathered information, I hope that you are now able to realize why you need to purchase a band saw. Nothing can be more pleasing and satisfying than when you get your money’s worth when purchasing products such as these mentioned above. I hope this band saw reviews can indeed help you make difficult decisions much easier. Band saw is an essential woodworking machine and it can be a great inconvenience when you buy the wrong one. Band saws have great potential and let you do your wood working in less time but with good quality results. Experts in the industry will attest how an excellent band saw can assist you do your work efficiently and accurately. Kreg is a brand known to enable and help do-it-yourself weekenders and woodworkers of all skill levels with their quality tools and products. From small home improvement projects to new builds, you can rely on Kreg to help you get the job done. 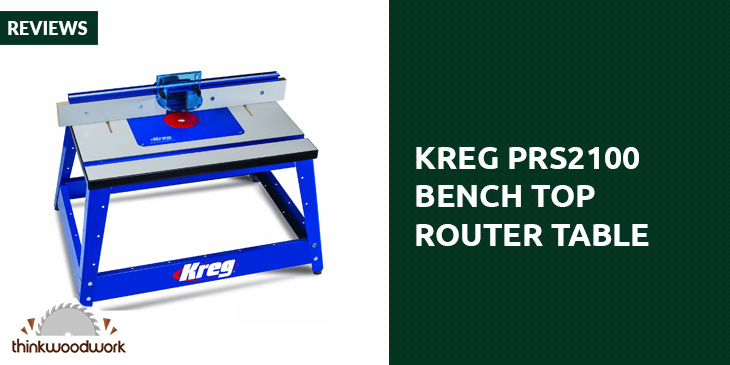 The Kreg PRS2100 Bench Top Router Table is just one of those tools. From cutting to crafting, this router table is a great addition to any garage or workshop where woodworking happens regularly. 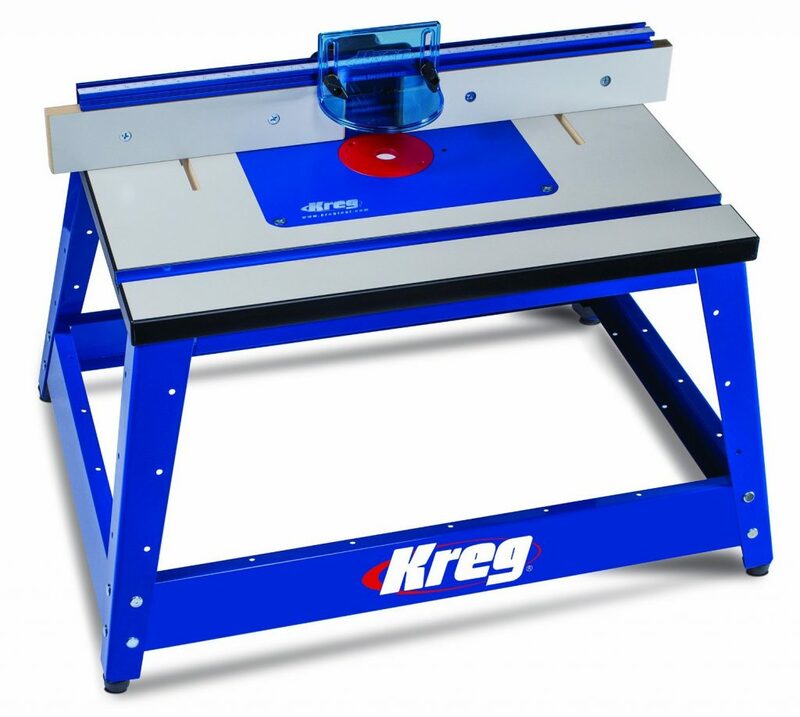 Kreg has redesigned their PRS2100 Bench Top Router Table for greater capability and precision. The 16 by 24-inch MDF tabletop with an Easy-Slide surface provides enough space and allows easy maneuvering for all kinds of woodworking projects. It has a full-sized router insert plate with Kreg’s Precision Insert Levelers and three Level-Loc reducing rings for accurate cutting and crafting. The all-new insert plate measures 9.25 by 11.75 by 3/8 inches to support even the biggest routers. It has an industrial-quality extruded aluminum fence that has adjustable sliding faces, vertical jointing, and new cam clamps. Sturdily built, which made it a practical purchase at its mid-range price point. Hardware is very precise and makes for accurate cuts on wood with every use. The design, miter gauge and flip locks can be improved. The bolts were also a problem for some, who said they had to use a screwdriver to keep them in place. A few reviewers also mentioned that their kit had missing parts when they received it after ordering. ​Those looking to get a good quality router table for DIY projects or weekend use would be pleased with the mid-range Kreg PRS2100 Bench Top Router Table. Despite the few design problems that seemed to be drawbacks for some, it’s a solid and practical table that will help you accomplish various woodworking projects. If you can work around some of the issues raised in reviews, which usually include the solutions, you will have this table working full functionality in no time. If you’re after reliability at a good price, you might want to consider this router table. At Think Woodwork, we are committed to building the Best Woodworking Authority resources on the internet. We want you to have a comprehensive and detailed guide to every part of your woodworking journey.